Search.searchws2.com is the PUP that uses misleading techniques to prevent removal. Use Reimage to locate malicious components and get rid of them faster than with uninstall instructions. A full system scan blocks virus reappearance and prevents traffic to malicious domains. Search.searchws2.com is a fake search engine created by Polarity Technologies. It is promoted in software bundles together with Weather Service browser extension. After the infiltration, it replaces built-in search box, homepage, and new tab URL address without leaving users a chance to revert these changes easily. All these features make it a browser hijacker. Changed homepage, default search engine, and new tab URL address, an increased amount of ads. track various information about users. All these negative features are hiding under a legit appearance of Search.searchws2.com. The homepage includes shortcuts to Amazon, Gmail, YouTube and weather-themed websites. Additionally, it redirects search queries to Yahoo which is a legit search provider. However, trusting the appearance is not recommended. The biggest issues are related to Search.searchws2.com redirect tendencies. The PUP can trick people into visiting shady sites when they click on a link or ad. While some of these sites just look for aggressive ways to increase their statistics; others are looking for potential victims. Researchers from LosVirus.es report about hijacker’s ability to redirect to phishing, tech support scam or even infected websites. Therefore, users can easily suffer from ransomware attack, data or money loss. Therefore, the elimination of this dubious app is needed. However, it’s impossible to remove Search.searchws2.com easily. If you replace this domain with Google or Yahoo, these changes will be rejected. It means that after computer reboot, you will see this shady search engine again. Proper Search.searchws2.com removal requires eliminating all hijacker-related components from web browsers and Windows (or Mac OS X). You can follow the guide at the end of the article, or you can speed up the process with Reimage. Search.searchws2.com is a fake Yahoo-based search tool that takes control over the targeted web browser. Search.searchws2.com hijack is unexpected and sudden. It happens when users incorrectly install free programs, meaning that they use Quick/Recommended installers. These settings are popular among users but trick ones. 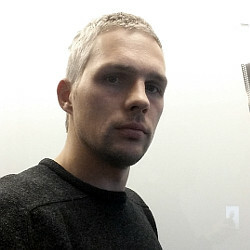 They do not reveal what third-party components might be spreading together with the primary program. To avoid replaced homepage or accidental installation of suspicious browser extension or PC optimization software, you have to stick to Advanced/Custom settings and monitor the process. If you see some pre-selected “optional downloads,” remove the ticks and continue the procedure. The instructions below will guide you through manual Search.searchws2.com removal. However, you can simplify and speed up elimination by scanning the system with an anti-malware program and resetting the browser. 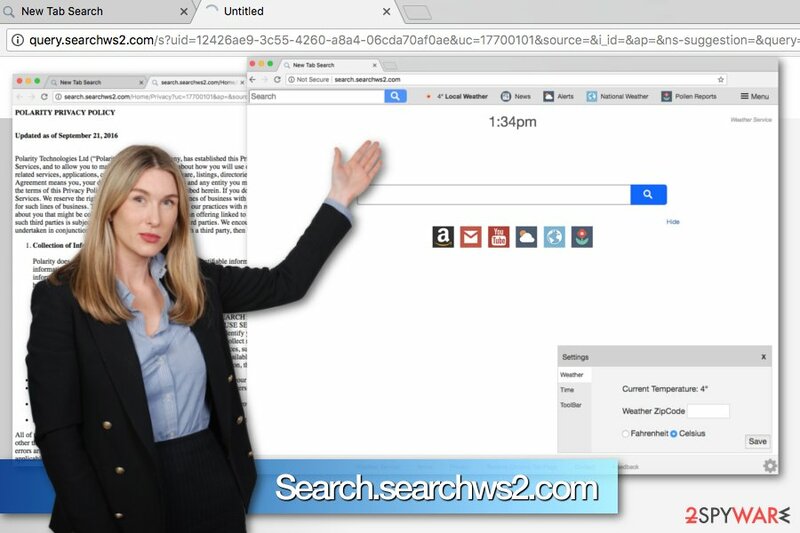 Here, look for Search.searchws2.com or any other recently installed suspicious programs. Wait until you see Applications folder and look for Search.searchws2.com or any other suspicious programs on it. Now right click on every of such entries and select Move to Trash. When in the new window, check Delete personal settings and select Reset again to complete Search.searchws2.com removal. Once these steps are finished, Search.searchws2.com should be removed from your Microsoft Edge browser. Uninstall Weather Service and other shady Mozilla Firefox add-ons. Here, select Search.searchws2.com and other questionable plugins. Click Remove to delete these entries. Now you will see Reset Firefox to its default state message with Reset Firefox button. Click this button for several times and complete Search.searchws2.com removal. Here, select Search.searchws2.com and other malicious plugins and select trash icon to delete these entries. Click Reset to confirm this action and complete Search.searchws2.com removal. 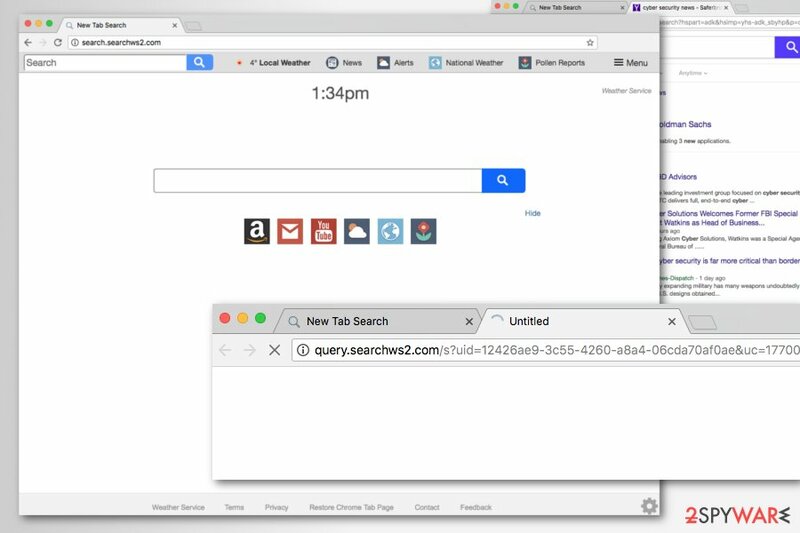 Here, select Extensions and look for Search.searchws2.com or other suspicious entries. Click on the Uninstall button to get rid each of them. Here, look at the Homepage field. If it was altered by Search.searchws2.com, remove unwanted link and enter the one that you want to use for your searches. Remember to include the "http://" before typing in the address of the page. Now you will see a detailed dialog window filled with reset options. All of those options are usually checked, but you can specify which of them you want to reset. Click the Reset button to complete Search.searchws2.com removal process. ^ Margaret Rouse. Browser hijacker (browser hijacking). TechTarget. The network of technology focused web sites. ^ Potentially Unwanted Programs and how to avoid installing PUPs. The Windows Club. The website about Windows. This entry was posted on 2018-04-03 at 05:54 and is filed under Stealing programs, Viruses. You can quickly scan the QR code with your mobile device and have Search.searchws2.com manual removal instructions right in your pocket. How did you remove Search.searchws2.com?